Is there anyone else out there that just feels the need to add a little bling everywhere? A little gold here, a little glitter there? It just makes everything a little more fun and pretty. When I made over the porch recently, I realized that these mason jars didn’t quite fit with the fun, colorful vibe going on out there. I wanted to keep them though to use as lanterns for extra lighting at night. My solution: Bling ‘Em Out. Now, I have sparkly glitter mason jars. This is a really simple and relatively fast craft project – you guys know I love the fast projects with instant gratification. 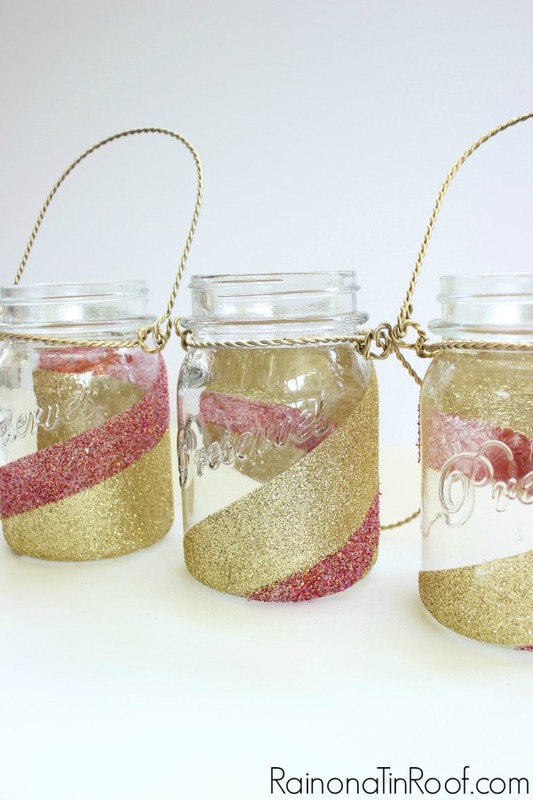 Before starting the glittering process, I spray painted the handles of my jars gold. The gold just worked better with the porch. 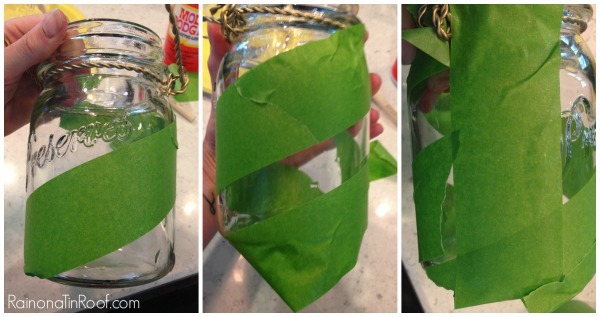 Grab your FrogTape and wrap a strip of it across the jar diagonally. I didn’t really do any sort of measurements with the tape. I just wrapped it around the jar as you can see in the photos above. I did keep a straight edge on the side of the jar – that’s why the straight vertical piece of tape is there. You don’t have to do this. You can just keep wrapping the tape if you want to. 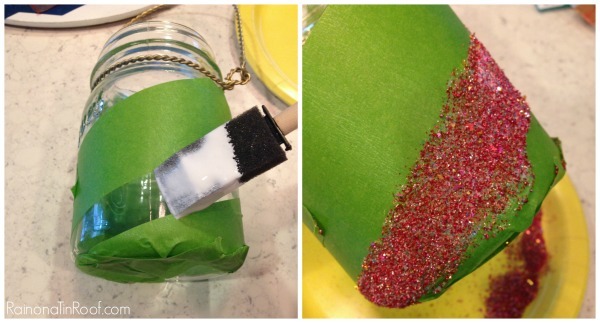 Use your foam brush to apply Mod Podge on the glass where you want the glitter. You don’t need a really thick coat, just an even coverage over the glass. Don’t let the Mod Podge sit too long – this stuff can dry fast on glass. As soon as you have put your Mod Podge on the glass, sprinkle your glitter on and let it sit for five minutes or so. Remove your tape carefully. If you just want one swirl of glitter – you are done! If you want two swirls (like I did), then you can repeat the first two steps and add another color of glitter. You can also skip the tape on this one and run your Mod Podge just along the edge of your first glitter color and apply your other glitter there. I have these hanging on large cup hooks in the screened-in porch. Gold glitter just gets me every time and the pink works perfectly on the porch. What are your favorite glitter colors together? Looking for more great craft and DIY projects for the home? 17+ Easy Crafts and DIY Projects Under $10 – you won’t believe what all is here! Looking to make a little money on your projects? Take a look at these 10 Easy Crafts to Make and Sell. Thanks, Debra!! 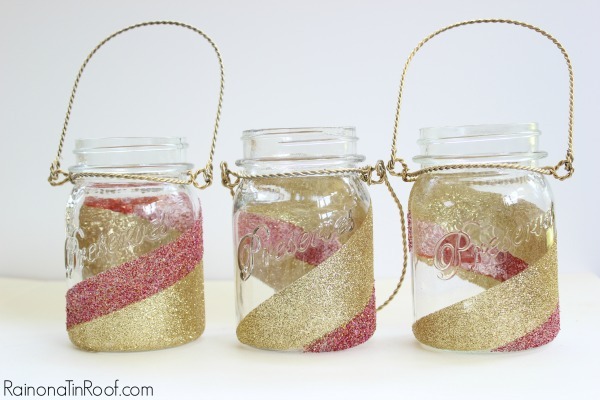 It was so easy and totally changes the look of the jars! I’m sure yours will be awesome! Me too, Julie! If its glittered, I love it!! Thank you! That’s exactly what we do, Jenn! Gold and glitter definitely makes everything prettier! 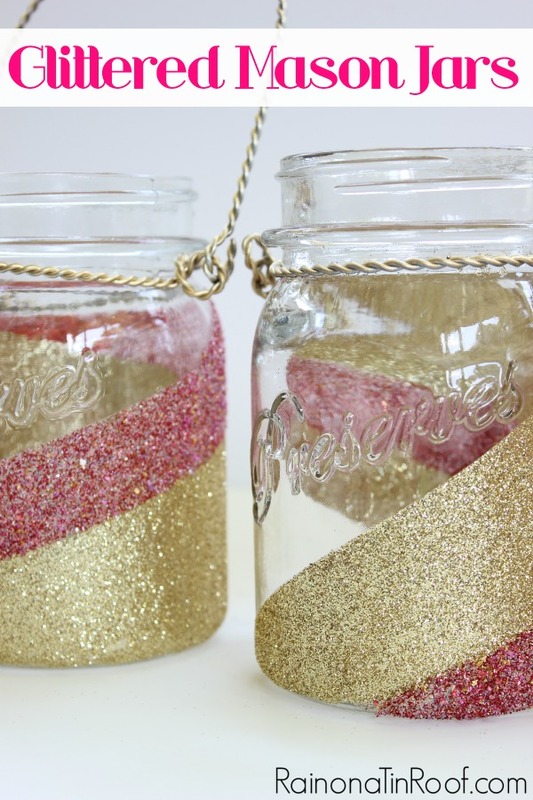 Love this idea to glitter-up some mason jars, or really any plain glass! Great idea, Jenna! Thanks, Emily! YES! Gold and glitter makes everything better! Those will be great at Christmas! They remind me of candy strips and all things cozy. Thanks for sharing! Yes, Kelley!! I’ve got a couple mason jar ideas for Christmas brewing in my head! Thanks! 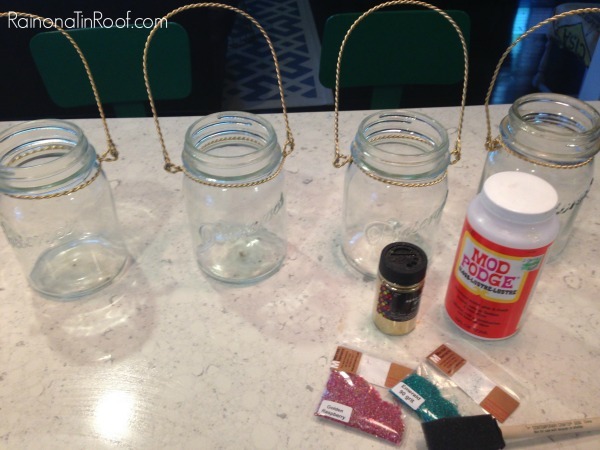 I am always looking for a fun mason jar craft! I love these! GLITTER!!! I am thinking silver glitter and leave clear class. Or silver and red. It would work for Christmas, football season and just flat out go with the backporch, house, well, my life. I’m doing these as soon as Thelma and Louise is over today. They just picked up JD. 🙂 Geeze Louise! hahahaha!!! Carrie, you totally crack me up!! And I love Thelma & Louise!! Beautiful, thanks for sharing on craft schooling sunday! So easy and effective. Thanks for sharing with us at #OvertheMoon link party and hope to see you next week. These are so cute. Thanks for sharing a the #inspirationSpotlight party. Pinned & shared. I love glitter too. These would make perfect party decorations for a baby or wedding shower. Pinned and sharing! Thank you for joining us at Family Joy Blog Link-Up Party last week. I hope you will join our next party starting Sunday at noon EST. It was just a basic pink glitter from Hobby Lobby I think, Nae! Where did you find the handles for these?